The 2 million renovation of the grand Victorian mansion at YHA York is now complete. All 45 rooms have been refurbished to a high standard, ensuring our customers a comfortable nights stay, and the number of en suite rooms now stands at 32. At the new York you'll find a new cafe bar, conservatory and state-of-the-art seminar facilities available for private hire. YHA York is back and better than ever. 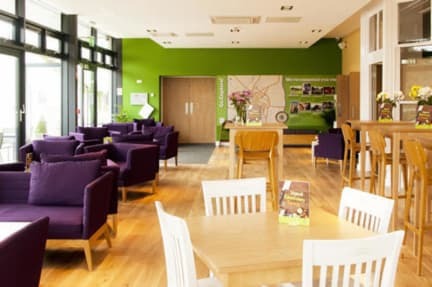 Standing in its own spacious grounds, YHA York provides the perfect base for exploring the beautiful historic City of York, with its world class attractions, shops, restaurants and mediaeval streets, all clustered together within the city walls and below the imposing York Minster. York is soaked in history. The Romans, Anglo-Saxons, Vikings and Normans have all left their mark. Stay in this attractive Victorian hostel and beat the traffic by strolling into the centre along the River Ouse. Visit the Minster, the National Railway Museum or the Jorvik Viking Centre. Premium rooms, great food and comfortable bar makes for a perfect city base. 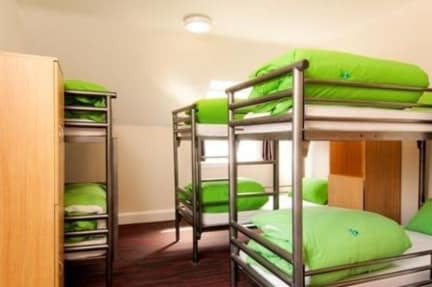 With 200 beds this hostel can get very busy, so book early. We have one accessible bedroom on the ground floor of the courtyard annexe with an accessible en-suite bathroom. The hostel was easily accessible by foot and bus, in a serene setting and with a historical connection to the progressive, community based spirit of York , congruous with the ideals of hostelworld. I have stayed here before and have never been disappointed. Was very impressed by this hostel and was actually interested to read about how the YHA got started (they have info plaques on the walls). It’s a bit of a walk from the train station with a heavy bag in tow but its located right next to the river and provided for some great views around the area. The rooms and facilities were clean and the social environment was comfortable. Hostel itself was nice, clean and quiet. The only thing was the bad smell in the corridor to our room. It made all of us feel very ill but you couldn’t smell anything in our room just outside of it which was a plus. They had ran out of locks to rent so we couldn’t lock our stuff securely in our room. Otherwise great stay. Wifi was very disappointing. Rather then providing access to the Internet, lots of private data was requested by a third party, that will then be shared wherever I may (accidentally) connect in the future. If I need to pay with my data, this is not free internet, and not what I expect when I am at a hostel, that advertises with free wifi. The facilities were clean and staff friendly, but having no internet was a real bummer. Overall pretty nice place. A little farther from city centre than I had thought, but not too bad of a walk. Mixed staff friendliness, some were great and some were...not as great. Definitely geared more towards family and older crowds.